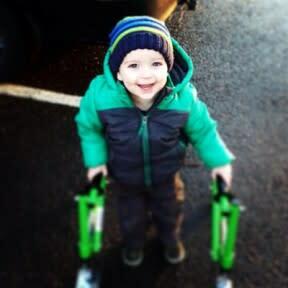 Max was born premature at 33+4 weeks in January 2012 fighting an infection which could have very easily become fatal. Even though he was strong and fought off the infection with the help of antibiotics, we found out after a MRI scan, that he had suffered a moderate level of brain damage. He was diagnosed at 18 months old with a condition called periventricular leukomalacia (PVL). In March 2014 we were also told Max has global developmental delay. Brainwave’s programme works on the theory of Neuroplasticity, and aims to help the brain find new pathways, therefore diverting brain signals past or around the damage Max’s brain has suffered. At present Max cannot stand or walk unaided, his muscles don’t receive enough signals from his brain to control them so makes him appear ‘floppy’. He has just begun to use a Kaye walker to build his strength. He is yet to say his first word and his current development is around 1 year. However, he works hard everyday to force his brain to receive new signals and make new connections around the damaged areas. He makes sounds in response to questions and he’s learnt to show people what he wants. We make sure he has every opportunity to do what he wants and never hold him back. Most importantly he wakes every morning with a smile ready to face a new day of challenges. His disability isn’t infectious but his smile is! Brainwave will devise a personal therapy programme for Max to improve his mobility, communication skills, and learning potential. We would be very grateful for any donations that can help raise the funds for Tree of Hope to support Max on his mission to reaching his full potential.